Efficiency and robustness properties of Gini's mean difference. SFB 823 seminar, Technische Universität Dortmund, Germany, June 2, 2015. Change-point tests based on U-statistics and U-quantiles. 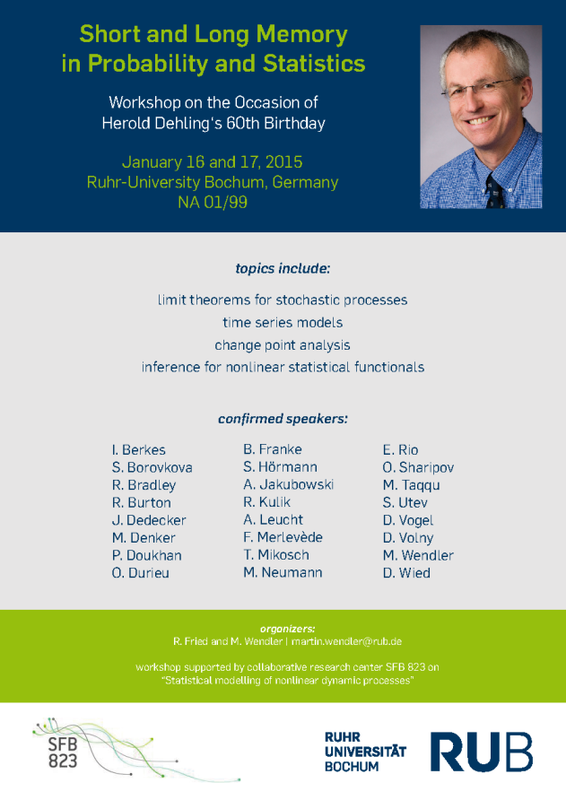 Workshop on Short and Long Memory in Probability and Statistics. Ruhr-Universität Bochum, Germany, January 17,2015. Change-point tests based on U-quantiles. 7th International Conference of the ERCIM Working Group on Computing & Statistics (ERCIM'14), University of Pisa, Italy, December 7, 2014. Robust estimators in Gaussian graphical models. 6th International Conference of the ERCIM Working Group on Computing & Statistics (ERCIM'13), University of London, UK, December 14, 2013. Robust estimators in Gaussian graphical modeling. Workshop on Graphical Models, Research Training Group (RTG) 1653, Ruprecht-Karls-Universität Heidelberg, Germany, November 15, 2013. On robust Gaussian graphical modeling. Hausdorff Center for Mathematics, Universität Bonn, November 12, 2012. An efficient and robust test for change-points in correlation. Department of Statistics and Biostatistics, Rutgers University, Piscataway, NJ, March 28, 2012. An efficient and robust test for change-points in correlation. Workshop Robust Methods for Dependent Data (Fakultät Statistik. Technische Universität Dortmund), Witten, February 27, 2012. An efficient and robust test for change-points in correlation. Department of Statistics, University of California, Davis, CA, February 9, 2012. A nonparametric test for change-point in correlation. 4th International Conference of the ERCIM Working Group on Computing & Statistics (ERCIM'11), University of London, UK, December 19, 2011. Elliptical graphical modelling. Workshop on Graphical Models and Related Fields, Northeast Normal University, Changchun, July 1, 2011. Elliptical graphical modelling. Humboldt Kolleg Mathematics, Statistics and Computer Science for Interpreting Structure, Chalmers Technical University, Göteborg, May 16, 2011. Elliptical graphical modelling in higher dimensions. International Biosignal Processing Conference (Biosignal 2010), Humboldt-Universität zu Berlin, July 14, 2010. Robust Partial Correlation Graphs. Freiburg Center for Data Analysis and Modeling (FDM), Universität Freiburg, Freiburg i. Br., Jan 29, 2010. Robust Estimation in Gaussian Graphical Models. 2nd Workshop on Information Theoretic Methods in Science and Engineering (WITMSE 2009), Technical University of Tampere, August 19, 2009.